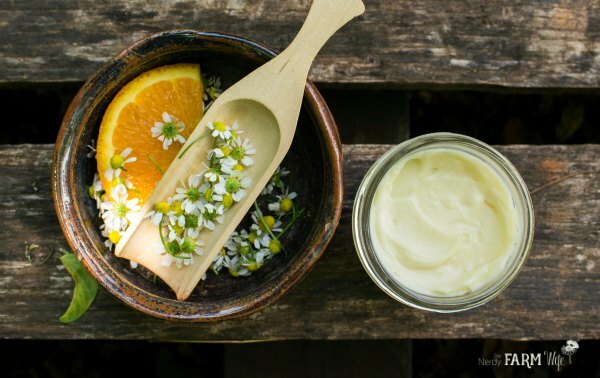 Learn how to make this non-toxic homemade natural deodorant recipe that features sweet orange and frankincense essential oils, along with herbal infused coconut oil for extra skin-soothing properties. 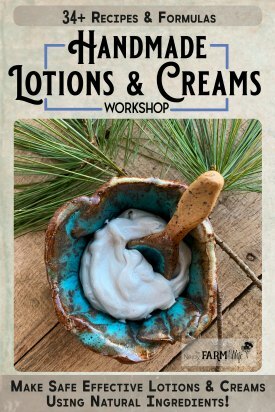 This recipe makes a cream style natural deodorant that you store in a jar and spread on with your fingers. You only need a small amount to be effective! I suggest infusing the coconut oil with beneficial herbs first (see below), but if you’re unable to, the recipe will work fine with plain coconut oil too. For the essential oils, I wanted a clean summery scent that would also be safe for sun exposure, all ages, pregnancy and breastfeeding. One of my go-to books for trustworthy essential oil information is: The Complete Aromatherapy & Essential Oils Handbook for Everyday Wellness. I settled on using sweet orange essential oil for the primary scent, along with a small amount of frankincense, at a total dilution rate of around 1%. I love this essential oil combination and hope you do too! To add an extra boost of goodness to your homemade deodorant, try infusing the coconut oil with herbs before making this deodorant. 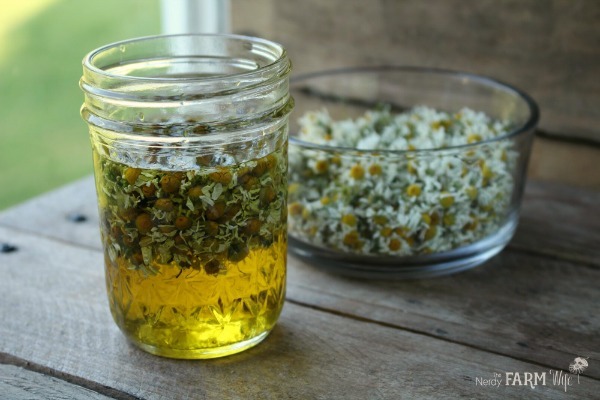 In addition, some herbs contribute other helpful benefits, such as the ones included in my DIY Herbal Deodorant for Women, which features ingredients helpful for lymph flow and breast health. Set the uncovered jar down into a saucepan containing several inches of water, forming a makeshift double boiler. Place the pan over low heat for 2 to 3 hours, keeping a close eye that the water doesn’t evaporate out. Remove the jar from heat, strain and use in your recipe. 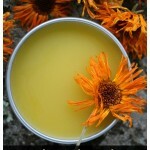 Place the shea butter, beeswax and coconut oil in a heatproof container or jar. Set the jar down into a saucepan containing a few inches of water. Heat the pan over medium-low heat until everything is completely melted. Stir in the baking soda, arrowroot powder and essential oils. Stir frequently while cooling to ensure a creamy texture. Spoon the finished deodorant in a jar. This recipe almost fills a 4 oz jar. Shelf life is around 9 months to 1 year. Keep out of direct sunlight and store in a cool dry area. If your deodorant turns out too hard for your preference, melt it again and add a teaspoon or two of a liquid oil, such as jojoba, sunflower, sweet almond, etc. If the deodorant is too soft, try melting it and adding a pinch more beeswax. Make sure to stir, stir, stir, especially in the first 5 to 10 minutes that the deodorant is cooling. This is what gives it a creamier texture. If your deodorant develops graininess over time, that’s likely from the shea butter. To fix, melt the batch of deodorant until entirely melted and no lumps remain. Stir well as it cools. You may need to add a few more drops of essential oil in case some of the scent evaporates during reheating. Remember that homemade deodorants help with odor protection, but they don’t act as antiperspirants. You will still sweat when using homemade deodorant. 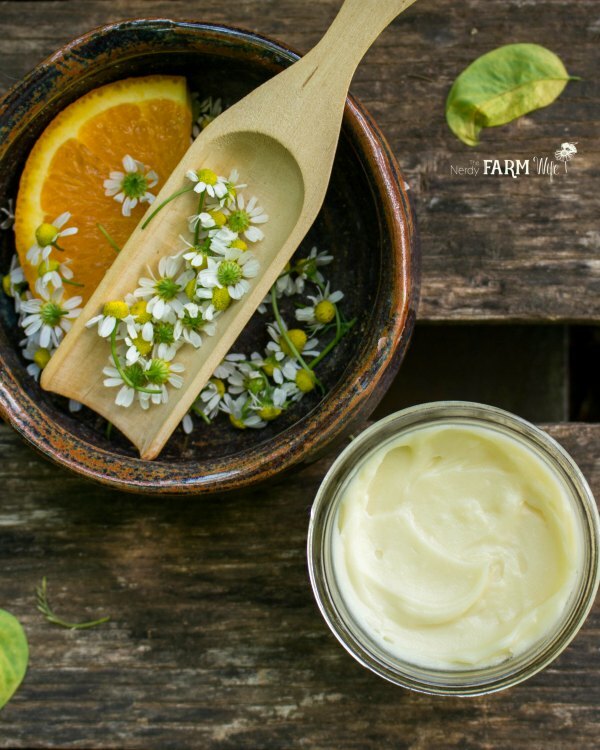 If you enjoyed this recipe for Sweet Orange & Frankincense Homemade Natural Deodorant, let’s keep in touch! 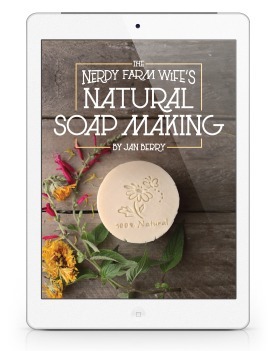 Subscribe to my newsletter and receive my best natural soapmaking tutorials, DIY body care recipes, plus creative flower & herb projects sent straight to your inbox 2 to 4 times per month. Tagged deodorant, frankincense, orange. Bookmark the permalink. where do you get your herbs and ingredients, and could you give me an idea of how much they cost? Hi Jen! You could try reducing the amount of coconut oil in a recipe to see if that helps. I live in old t-shirts, so haven’t really noticed any grease stains, but with nicer clothes that may very well happen! Less coconut oil and perhaps more arrowroot (or whatever the absorbent ingredient is in your recipe – like cornstarch, clay, etc) may help. And I’ve preferred to make stick style so I don’t get fingers/hands all messy. Although I’ve never tried a cream deodorant so I’m making an assumption that there’s mess after applying. That scent combination sounds amazing! Thank you for this recipe! As I don’t have orange eo on hand what I could substitute it with? I checked also the other recipe you posted a while ago – I have neem powder (not oil as you have used) how much would you recommend to use instead.. Thank you in advance for all your help. I always enjoy to read and to try to make your recipes. Keep up the good work!! Hi Ana! Instead of orange essential oil, you could try something like grapefruit or lemongrass (though be aware some skin types are extra-sensitive to lemongrass), or for a different scent profile you could try cedarwood (atlas) and lavender. This sounds great! Can substitute the arrowroot powder for tapioca starch? 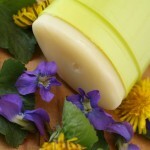 Is there an alternative to the beeswax that can be successfully used? Hi Jessica! You could experiment with candelilla wax instead. I usually start off with about half as much candelilla wax as beeswax. In this recipe, that’d be 1/2 oz candelilla wax instead of 1 oz beeswax. I’ve been reading your blog for a while now, I tend to visit it every few months or so. I’m keen to actually start trying some of these recipes. But I’m mostly worried about using the right equipment. Do you have a post where you go through what pots/pans you use, what implements you use and what materials equipment is made out of and their sizes? but I don’t have one specifically for body care products. That’s a wonderful idea though; I’ll add that to my blog post list! Jan, I just wanted to say that this recipe is wonderful. 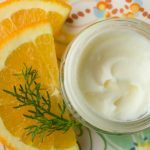 My husband and mother are very sensitive to baking soda, so I have to be so cautious with these natural deodorant recipes. But your recipe has worked perfectly on all of us, no irritation and no stink! This is a big deal when you consider we live in Texas and it is summertime right now. The only change I will make next time is adding a few more tsp of arrowroot powder. Then it will be a little more powdery and less sticky. As is it is great, but during the humid weather the extra arrowroot will be a nice addition.